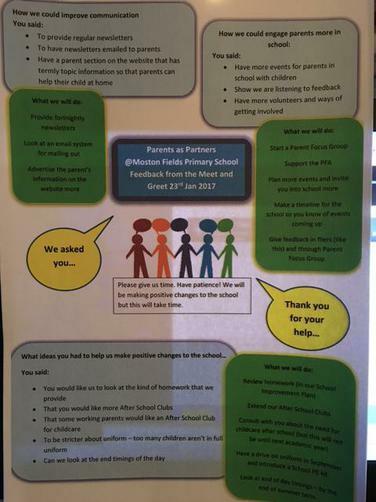 At the Meet and Greet meeting last Monday (23/1/17) Parents were asked for their feedback about various aspects of school and ideas for the future. The feedback from the parents who attended was sent home on Friday on the back of the newsletter. A good number of parents have signed up to join the Parent Focus Group. The first meeting will take place on Thursday 2nd February. More information and a new page in the parents section of this website to follow soon!